Shawnee Mission South fell behind Lawrence 14-3 in the second quarter, but the Raiders rallied for a 30-24 win behind senior quarterback Jack Roberts. Roberts passed for 154 yards and two scores and added 119 yards and a touchdown on the ground to lead South to its fourth victory of the season. Roberts’ touchdown pass to Sam Macklin in the second quarter gave the Raiders a 17-14 lead they wouldn’t relinquish. Macklin added a second touchdown catch in the third quarter. Devin Neal rushed for 85 yards and two touchdowns to lead Lawrence. Shawnee Mission South (4-2) is one win away from capturing the school’s first winning season since 1997. Dodge City scored all 34 of its points in the second half in rallying to shock Hays High, 34-33 on the Indians’ homecoming. Hays led 20-0 at halftime and 33-14 early in the fourth quarter before the Red Demons rallied for three consecutive touchdowns – the final score coming on a 65-yard hook-and-ladder pitch from John Johnson to Jaiel Johnson with 3:35 remaining. Junction City played solid defense and scored in the fourth quarter to upset rival Manhattan, 9-7. Russell Wilkey’s 5-yard touchdown run on the first play of the fourth quarter proved to be the winning points for the Blue Jays. The Junction City defense held Manhattan to from there on out, turning away the Indians with a pair of interceptions and a fourth down stand. Defensive back Aaron Hamilton intercepted three passes for the Blue Jays in the game. Nine of the past ten meetings between Manhattan and Junction City have been decided by single digits. Graham Mertz threw for 355 yards and five touchdowns as Blue Valley North won for a third straight week – 48-6, over Blue Valley Southwest. Mertz connected with Cameron Burt eight times for 162 yards and two scores and Erik Roberts six times for 130 yards and two touchdowns. Amauri Pesek-Hickson led the ground game with 166 yards and a touchdown. Blue Valley Southwest’s points came on two field goals by Dominik Stadlman – including a school-record 53-yard boot to open the scoring. Olathe Northwest picked up its first win of the season and first win for new coach Aaron Hafner with Friday’s 29-21 decision over Shawnee Mission Northwest. Andrew Dumas rushed for 186 yards and three scores to lead the Ravens. Olathe Northwest rushed for more than 430 yards in the game in handing the Cougars their second loss of the season. Great Bend defeated Andover Central, 30-7, in a game called at halftime due to severe weather. Koy Brack passed for 217 yards and three touchdown passes – all to Alex Schremmer who caught seven passes for 126 yards. Brack also added a touchdown run and the Panthers were led in rushing by Gage Fritz’s 72 yards. Great Bend’s defense held the Jaguars to negative 16 yards rushing. Lansing scored 22 points in each of the first and second quarters in rolling past KC Harmon, 51-0. Ten Lion running backs combined for 299 rushing yards and six rushing touchdowns. Junior Luke Schneider scored two touchdowns to go with 48 yards rushing. Jourdan Bridgette led Lansing with 80 yards rushing on seven carries. Wichita Heights rallied from down 25-10 in the fourth quarter to force overtime with Wichita South. The Falcons then won the game, 32-25, in overtime on a Joshua Sanders 9-yard touchdown run. The Falcons rallied despite not having the services of K’Vonte Baker who left the game with an injury. Armaad Hubbard’s 2-yard touchdown in the middle of the fourth quarter pulled the Falcons to 25-17. Hubbard later scored with less than three minutes left to tie the game at 25. Hubbard rushed for 73 yards and two scores, while Sanders led the team with 101 yards and two touchdowns. Antwain Scales rushed for a game-high 161 yards for Wichita South, along with two touchdowns. KC Schlagle scored 34 points in the first quarter as part of a 54-14 win over KC Sumner Academy. Josh Becton rushed for two scores and threw a touchdown pass to Drelyn Carroll in the first quarter. After Becton’s second touchdown run, Sumner’s Nahshon Houston returned the kickoff 95 yards for a score. On the ensuing kickoff from that score, Schlagle’s Kendall Brewer returned the favor with an 80-yard kickoff return for a touchdown. Shawnee Heights rushed for 484 yards in pulling away from Leavenworth in the second half, 35-20. The T-Birds were led by Hunter Wohler’s 135 rushing yards and two touchdowns, while Davion Gardenhire (134 yards) and Freddy Maisberger, IV (116 yards) also broke the 100-yard mark. Seth Drennan paced Leavenworth with 195 yards rushing and two scores. Emporia rolled to a 63-0 shutout of Topeka Highland Park. The Spartans exploded for 35 points in the second quarter to lead 49-0 at halftime. Skyler Douglas rushed for 82 yards and a pair of touchdowns to start the Spartan onslaught. Jace Stewart completed four of his five passes for 124 yards and a touchdown along with rushing for a 24-yard score. Tonganoxie won its fourth consecutive game by edging Spring Hill, 21-15. Korbin Riedel rushed for 102 yards and a touchdown on 29 carries. Quarterback Hayden Robbins passed for 143 yards, including a touchdown to Elijah Tyner. Tyner caught four passes for 118 yards and also returned an interception 80 yards for another score. The Chieftains sit along in second place in the Frontier League standings behind unbeatens Paola and Louisburg. Tonganoxie’s only league loss came 27-7 to Louisburg in Week 2. Two of Spring Hill’s four losses have come by less than six points. The Broncos’ four losses have come against opponents that are a combined 21-3. The Winfield Vikings evened their record at 3-3 with a 28-12 win over El Dorado. Quarterback KC Crandall completed 15 of 18 passes for 183 yards and three touchdowns to pace the Viking offense. Crandall threw touchdown passes to Jacob Weber and Mark Clifford in the fourth quarter to allow the Vikings to maintain a two-score lead. Weber led the Vikings with five catches for 80 yards, while Jordan Chism caught Crandall’s other touchdown pass – a 41-yarder in the second quarter. El Dorado running back Braden Morgan was exception in a losing effort. Morgan rushed for 252 yards and two touchdowns on 34 carries, but Winfield forced the Wildcats into four turnovers. Winfield is 10 points away from being 5-1 this season. The Vikings lost 7-3 to rival Ark City to open the season, and 26-20 to Labette County in Week 4. Eli Fahnestock passed for 148 yards and two touchdowns as Andover rolled to a 42-7 win over Arkansas City. Both of Fahnestock’s touchdown passes went to junior Peyton Henry who had a huge night. In addition to Henry’s four receptions for 76 yards, he also gashed the Bulldog defense for 207 rushing yards and a score on 27 carries. Congratulations to Eudora first-year coach Sean Hayden for earning his first victory as the Cardinals defeated Ottawa, 26-7. Eudora scored once in each quarter to pick up the win. Gavin Elston rushed for a pair of touchdowns to lead the Cardinals. Mulvane used a big night from junior running back Cole Diffenbaugh in defeating Rose Hill, 48-20. Diffenbaugh rushed 21 times for 268 yards and four touchdowns and caught a 69-yard touchdown pass from Tab Creekmore. Creekmore completed half of his 14 pass attempts for 117 yards and added a rushing touchdown. Mulvane led 28-0 after three quarters before the Wildcats and Rockets played a wild fourth quarter that resulted in 38 total points scored. Bonner Springs picked up its third win of the season with a 40-9 decision over Baldwin. Noah Villarreal threw two touchdown passes and added a third score on the ground. The Braves were led by junior Bryce Krone’s 125 yards and two scores on the ground. Andrew Puckett and Nasjon Porter caught touchdowns from Villarreal. Halstead defeated Clay Center, 50-22, behind a huge game from junior Scott Grider. He had 16 carries for 303 yards and five touchdowns. The Dragons rolled up 47 carries for 494 yards and seven scores. Halstead completed 1 of 3 passes for seven yards. Senior Braden Gerber and junior Brian Casey each had a rushing score. Holcomb won its second straight and moved to 3-3 with a 15-13 win versus Kingman. The Longhorns scored nine fourth quarter points to win the game after neither team scored in the third. Junior Kobe Hands has taken over at quarterback. He completed 14 of 22 passes for 237 yards with a 2/1 TD/INT ratio. Holcomb had 29 rushes for 67 yards. The Longhorns have averaged 133 passing and 133 rushing yards a game. Hesston defeated Rock Creek, 54-30, as Parker Roth and Cameron Cox, both banged up earlier in the year, had big games. Roth recorded 20 carries for 314 yards and five scores. Cox passed for 140 and ran for 60. Nick Arnold delivered a pick-six. Roth scored on runs of 62, 44, nine, 60, and 52 yards. Hesston rolled up 559 yards of offense. Iola may have pulled the surprise of the week with a 28-6 homecoming win over Burlington. The Mustang defense limited Burlington’s ground-heavy attack to only 96 yards on 41 attempts. The Wildcats only score came in the game’s final three minutes after an Iola fumble set up Burlington inside the Mustangs’ five-yard line. Isaac Badders rushed for two touchdowns to lead the Iola offense. Quarterback Casen Barker also contributed a touchdown pass to Elijah Luedke. Iola moves to 2-4 with the win, while Burlington falls to 3-3. Santa Fe Trail scored in each of the first three quarters to hold off Wellsville, 22-8. Will Herren rushed for 118 yards and two scores as the Chargers picked up a key win to keep their playoff hopes alive in District 3. Southeast of Saline’s Jaxson Gebhardt had a big game with 193 passing and 158 rushing yards in a 48-20 win against Mission Valley. Eli Harris had a 22-yard pick-six in the third quarter. Gebhardt had several big plays, including TD passes of 62 and 16 yards and rushing scores of 56 and 34 yards. The Trojans moved to 5-1 and has bettered last season’s mark of 4-5. Douglass defeated Cherryvale, 44-8, and continued a surprising season. Douglass moved to 5-1 and scored 24 unanswered points. The Bulldogs outgained Cherryvale, 366-247, including a 140-0 edge in passing yards. Zac Dressler has rushed for 1,151 yards and 14 scores with 138 carries. Douglass has already posted its most victories since 2013. Eureka ended a four-game losing streak with a 36-22 victory versus Neodesha. Eureka (2-4) is playing an all road schedule because of stadium destruction from a tornado in June. Like many other opponents, Neodesha helped Eureka with some costs, including more than $1,000 raised from the booster club. The Tornadoes trailed 16-15 at halftime before the comeback. Cade Burden finished 10 of 23 for 263 yards with three touchdowns, one interception and a rushing score. Zach Hare hauled in three catches for 137 yards, all for scores. Brennan Lowe tallied 11 carries for 79 yards for a touchdown and had a 68-yard reception. Southeast-Cherokee moved to 4-2, 2-1 after a 21-7 win against Erie after it entered the season with a 28-game losing streak. The Lancers have averaged 289 rushing yards a contest. Senior quarterback Brett Malle has 509 passing and 405 rushing yards. St. Mary’s Colgan rolled over Yates Center, 70-15, and set up a matchup with undefeated Pleasanton this Friday for the District 1 title. Colgan led 21-0 halfway through the first quarter. Kash Marietta had a 42-yard touchdown run, Cade Simmons tossed a 17-yard touchdown pass to Cal Marquardt, and fullback Domenico Bevilacqua had a 12-yard TD run. Colgan eventually led 35-7 at the end of the first quarter and 63-7 at halftime. Plainville defeated La Crosse, 35-0, in a game that was called shortly before halftime. Jared Casey broke through a 70-yard touchdown run early. Plainville outgained La Crosse, 372-34. Ell-Saline defeated Republic County, 55-14. Nick Davenport threw for 310 yards and three scores. Ell-Saline led 27-0 at halftime and finished with 546 yards, including 333 in the air. All three of Davenport’s TD throws were big plays - 49 yards to Trenton Peterson and 35 and 46 to Parks. Sawyer Kramer had 91 rushing yards on four carries and five catches for 89 yards. Hillsboro improved to 5-1 on the season with an 18-14 victory over rival Marion. The Warriors held a slim 14-12 lead late in the game and had the ball inside the Hillsboro 15-yard line threatening to add to their lead. But on a fourth-down play, Hillsboro’s Wes Shaw snagged a deflected pass from Marion’s Blaine Mermis out of the air and the 6-foot-2, 260-pound Shaw raced 87 yards for what would become the game-winning points. Inman rolled to a 56-6 victory over Sublette. The Teutons rushed for more than 400 yards in the game led by Matt Ramey’s 199 yards and two touchdowns on only five carries. Sublette scored in the game’s final seconds. After entering the season on a 10-game losing streak, Inman has posted four wins for the first time since 2013. Victoria moved to 4-2 with a 52-6 win against Washington County. Cooper Windholz recorded 69 passing yards and led the team with 52 rushing yards. Victoria outgained the Tigers, 286-51. Victoria led 44-6 at halftime. Windholz passed for three scores and rushed for one. Both of Caden Oberle’s receptions went for touchdowns. Hill City defeated Lincoln, 55-6. The Ringnecks moved to 4-2. Conner Born completed 4 of 4 passes for 61 yards. Dalen Journigan delivered 129 rushing yards and a touchdown. WaKeeney-Trego beat Oberlin-Decatur Community, 38-22. Dallas Schneider had five rushing scores with 16 rushes for 166 yards. Keagan Shubert had 162 passing yards and a score. The Golden Eagles moved to 4-2. Hoxie rolled over Atwood-Rawlins County, 54-0. Jared Kennedy passed for two scores and rushed for one. Dylan Weimer had two rushing scores, and Wylie Weems had a pick-six. Moundridge moved to 3-3 with a 52-6 win against St. John. The game was called with nine minutes left in the contest. Dillon Vogts rushed for two scores, passed for two TDs and had a reception. Gage Diederich recovered a blocked punt for a touchdown and had a receiving score. Little River improved to 5-1 with a 52-6 win over Macksville. The Redskins led 32-6 at halftime and added 22 points in the third quarter to end the game. Graham Stephens completed all six of his passes for 177 yards and three touchdowns. Stephens also rushed for 96 yards and a score. Hunter Thomas led the Redskins on the ground with 119 yards and three touchdowns while catching a long touchdown pass from Stephens. 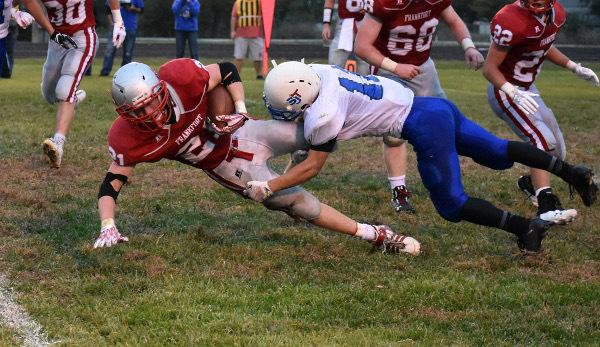 Frankfort remained undefeated at 6-0 with a 60-14 victory against Beloit St. John’s-Tipton. Frankfort limited BSJT to 183 yards of total offense. The Wildcats led 16-14 at halftime and then scored 44 unanswered points in the second half. Garret Dalinghaus rushed for 216 yards and six touchdowns to lead the Wildcats. Frankfort gets Axtell and at Hanover in a pair of marquee games to finish the regular season. Northern Valley defeated Sylvan-Lucas Unified, 28-20, and bumped to 5-1 in District 5. Osborne, which the Huskies play this week, is 3-0 in district, followed by Northern Valley and Thunder Ridge at 2-1. Senior Nick Stutsman returned at quarterback for the Huskies and completed 5 of 12 passes for 39 yards. Senior Aidan Baird had 17 carries for 114 yards and three TDs. Stutsman recorded 15 carries for 63 yards and a score. Senior Caden Bach recorded 21 tackles, including 17 solo. Thunder Ridge defeated Logan-Palco, 40-38, in overtime and moved to 4-2. Thunder Ridge recorded just 164 yards of offense, while the Trojans recorded 179 rushing and 159 passing. Junior Cody Brown led Logan-Palco with 29 carries for 132 yards and a score. Freshman Dylan Van Laeys completed 13 of 23 passes for 159 yards and a 3/1 TD/INT ratio. However, Thunder Ridge senior Brandon Grauerholz and junior Joseph Ferguson were excellent on non-offensive plays. Grauerholz had 194 all-purpose yards with 35 rushing, 24 receiving, 85 kick return and 50 punt return. He returned both a punt and kick for a score. Ferguson recorded 20 rushing and 76 on a pair of interception returns. Thunder Ridge recovered four fumbles and forced six turnovers. The Longhorns had four non-offensive touchdowns with one apiece by fumble, interception, punt return and kick return. Quinter defeated Wheatland-Grinnell, 54-20, and ended a 33-game losing streak. Collin Blackwill had three touchdown passes and completed 5 of 6 passes for 88 yards. Tucker Gillespie finished 22 carries for 156 yards and three TDs, while Kasen Ostmeyer and Blackwill had a rushing score. Triplains-Brewster defeated Tribune-Greeley County, 20-14. Weston Schmidt rushed for 190 yards and a score. Weskan took a big step in claiming the 6-Man North division title with a late touchdown to top Golden Plains, 52-46. Weskan quarterback Jace Mackley completed 18 of 42 passes for 318 yards and five touchdowns. Mackley also rushed for 185 yards and two more scores in the game as the Coyotes handed Golden Plains its first loss of the season. Dylan Spresser led the Bulldogs with 232 yards rushing and three touchdowns, while Caleb Korte added four rushing scores. Ashland remained unbeaten on the season with a 48-6 win over Fowler. Sophomore Gage Branson led the Blue Jays with 77 yards rushing and three touchdowns, while classmate Kash McPhail added two rushing scores.